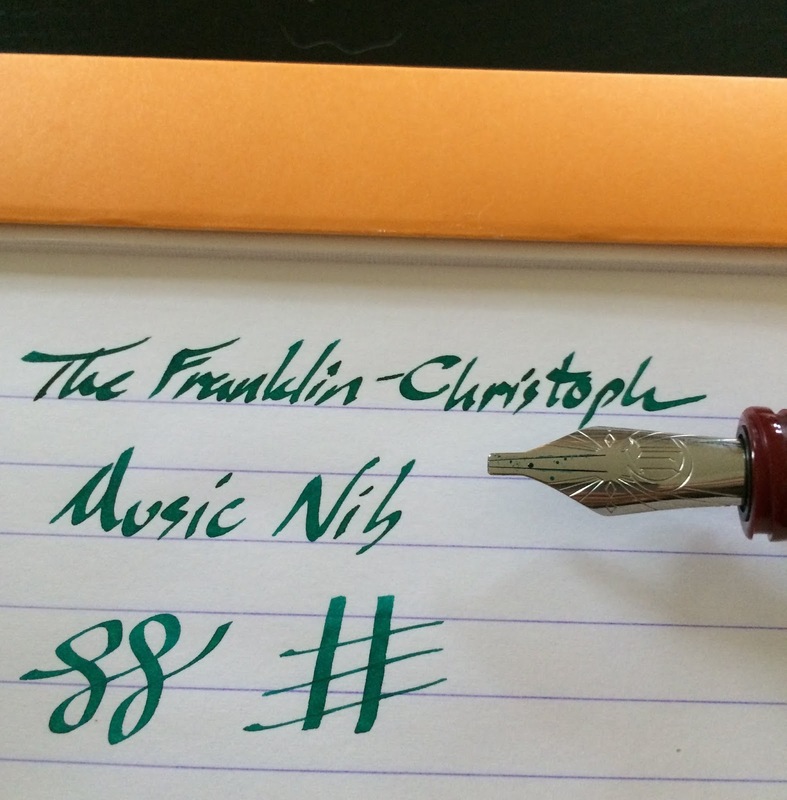 Franklin-Christoph Emerald 357 | Inkdependence! My new favorite green ink? Yep. this one is a bright, rich green that works perfectly well even on copy paper. I've not used it in a fine nib, yet, but it works really well in mediums and huges (the 1.9mm Christoph nib). I realize that this isn't going to be the ink that everyone reaches for when they want to write something serious. Probably most offices won't encourage you to write in green. If you're writing notes, letters, shopping lists, etc then you're going to like this ink. I thought that the different nibs deserved a bit more of a close-up. Even the two mediums are quite different. Really good shading, on these, though. The shot below is one that I took last year when we got Audrey a Franklin-Christoph with the music nib. I really liked the green ink they filled it with, and I'm nearly sure it was this one. It was in a cartridge, I think. There's just a little bit of bleed on the music nib sample. That's pretty impressive for a nib that big. Well done, Emerald 357. I really like that blue at the top. It's kinda like the old Sailor Sky High. If this is an ink color then take my money! This one isn't really close to any of the "green" inks that I have loaded up. I don't have any true greens in pens right at the moment, but these three near-greens will have to suffice. You can find these inks at Franklin-Christoph's site for $12.50 in a 2oz glass bottle. Emerald 357 is a fresh green, it behaves well on copy paper, and it would be a good buy for anyone looking for an awesome green to brighten their day (or page, whatever). This is one that I would have bought if I didn't already have a bottle. So good. This ink was provided to me for review purposes, but all of my reviews reflect only my own experiences and opinions of a product. Do you like this blog? Want to help support it? Well! Head over to Patreon to find out how you can lend your support to this blog.